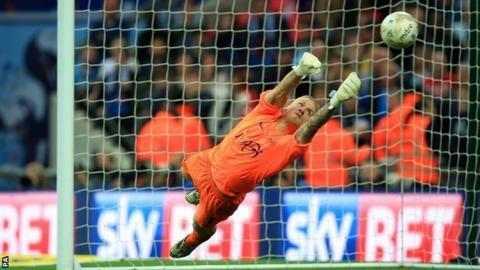 Southend goalkeeper Daniel Bentley was his side's hero as the Shrimpers beat Wycombe on penalties to win the League Two play-off final at Wembley. With Southend 7-6 up in the shootout, Bentley kept out Sam Wood's effort to earn his side promotion to League One. Earlier, Bentley had deflected Joe Jacobson's 25-yard free-kick into his own net to give Wycombe an extra-time lead. But Joe Pigott slotted home in the 122nd minute to take it to penalties. Wycombe goalkeeper Alex Lynch, making only his third senior start, saved the second Southend penalty from Ben Coker but, after Wanderers midfielder Matt Bloomfield - a first-minute substitute for the injured Sam Saunders - missed Wycombe's fourth penalty and the next two were scored, it went to sudden death. Both sides converted their next two and, after Cian Bolger fired in the 15th penalty of the shootout, Bentley tipped Wood's effort onto the post to end the Shrimpers' five-year stay in the fourth tier. It was third time lucky for Southend, having lost in the play-offs twice in the previous three seasons. Defeat will be bitterly disappointing for Gareth Ainsworth's Chairboys, who last season avoided relegation out of the Football League thanks to a final-day win over Torquay. They finished fourth in the regular season, one place above Southend, and reached the final thanks to a 5-3 aggregate victory over Plymouth. The first half was a drab affair, but had Bolger not been adjudged to have pushed a defender at an early free-kick then Barry Corr's powerful header into the net for Southend would have stood. Both Corr and veteran defender Adam Barrett spurned headed second-half chances as the Shrimpers looked to take control. But when Paul Hayes was fed in by Aaron Holloway, Bentley had to be at full stretch to deny his low strike. Bentley then pulled off a remarkable stop to deny Aaron Pierre's late headed effort as the tie went to an extra 30 minutes. And when Michael Timlin fouled Holloway on the edge of the box, Jacobson's curling free-kick hit the bar and bounced off the unfortunate Bentley and into the net. Southend pressed hard and their attacking approach gave Holloway a chance to seal victory, but his mazy run was stopped by a despairing diving tackle from Coker. And Myles Weston played a ball into the box from the left and Pigott, on loan from Charlton, struck into the far corner to send the game to penalties. Match ends, Southend United 1(7), Wycombe Wanderers 1(6). Penalty Shootout ends, Southend United 1(7), Wycombe Wanderers 1(6). Penalty saved! Sam Wood (Wycombe Wanderers) fails to capitalise on this great opportunity, left footed shot saved in the top right corner. Goal! Southend United 1(7), Wycombe Wanderers 1(6). Cian Bolger (Southend United) converts the penalty with a right footed shot to the top right corner. Goal! Southend United 1(6), Wycombe Wanderers 1(6). Aaron Holloway (Wycombe Wanderers) converts the penalty with a right footed shot to the bottom left corner. Goal! Southend United 1(6), Wycombe Wanderers 1(5). Myles Weston (Southend United) converts the penalty with a left footed shot to the bottom right corner. Goal! Southend United 1(5), Wycombe Wanderers 1(5). Joe Jacobson (Wycombe Wanderers) converts the penalty with a left footed shot to the bottom left corner. Goal! Southend United 1(5), Wycombe Wanderers 1(4). Adam Barrett (Southend United) converts the penalty with a left footed shot to the high centre of the goal. Goal! Southend United 1(4), Wycombe Wanderers 1(4). Marcus Bean (Wycombe Wanderers) converts the penalty with a right footed shot to the bottom left corner. Goal! Southend United 1(4), Wycombe Wanderers 1(3). Michael Timlin (Southend United) converts the penalty with a left footed shot to the bottom right corner. Penalty saved! Matt Bloomfield (Wycombe Wanderers) fails to capitalise on this great opportunity, right footed shot saved in the bottom left corner. Goal! Southend United 1(3), Wycombe Wanderers 1(3). Jack Payne (Southend United) converts the penalty with a left footed shot to the bottom right corner. Goal! Southend United 1(2), Wycombe Wanderers 1(3). Paul Hayes (Wycombe Wanderers) converts the penalty with a right footed shot to the high centre of the goal. Goal! Southend United 1(2), Wycombe Wanderers 1(2). Ryan Leonard (Southend United) converts the penalty with a right footed shot to the high centre of the goal. Goal! Southend United 1(1), Wycombe Wanderers 1(2). Alfie Mawson (Wycombe Wanderers) converts the penalty with a right footed shot to the bottom right corner. Penalty saved! Ben Coker (Southend United) fails to capitalise on this great opportunity, left footed shot saved in the centre of the goal. Goal! Southend United 1(1), Wycombe Wanderers 1(1). Peter Murphy (Wycombe Wanderers) converts the penalty with a right footed shot to the bottom left corner. Goal! Southend United 1(1), Wycombe Wanderers 1. Joe Pigott (Southend United) converts the penalty with a right footed shot to the bottom right corner. Penalty Shootout begins Southend United 1, Wycombe Wanderers 1. Second Half Extra Time ends, Southend United 1, Wycombe Wanderers 1. Goal! Southend United 1, Wycombe Wanderers 1. Joe Pigott (Southend United) left footed shot from the centre of the box to the bottom right corner. Assisted by Barry Corr with a headed pass. Attempt missed. Joe Pigott (Southend United) header from the centre of the box misses to the left. Assisted by Ben Coker with a cross. Hand ball by Michael Timlin (Southend United). Jack Payne (Southend United) wins a free kick on the left wing. Ryan Leonard (Southend United) is shown the yellow card. Sam Wood (Wycombe Wanderers) is shown the yellow card. Foul by John White (Southend United). Aaron Holloway (Wycombe Wanderers) wins a free kick on the left wing. Substitution, Wycombe Wanderers. Peter Murphy replaces Nico Yennaris because of an injury. Delay in match Nico Yennaris (Wycombe Wanderers) because of an injury. Second Half Extra Time begins Southend United 0, Wycombe Wanderers 1. First Half Extra Time ends, Southend United 0, Wycombe Wanderers 1. Attempt blocked. Jack Payne (Southend United) right footed shot from the right side of the box is blocked. Assisted by Myles Weston. Ben Coker (Southend United) wins a free kick in the defensive half. Foul by Ben Coker (Southend United).